We sub contract fur tanning. This means that we personally do not tan the fur, but instead skin the animal and ship the raw skin to another small business that professionally prepares and tans the hide, and then returns it to us to return to you. Because it is a subbed out service, OddArticulations, LLC, is not the one making the prices. We take a very small cut for our time skinning the animal and our shipping supplies, but the prices for the actual tanning is set by the business that tans the furs. Full Pelt Tanning: This is when the full animal is tanned. Including full body, tail, face, and usually feet. Price varies based on size of the pelt. An animal the size of a rat would be as cheap as $40, while a large dog can be upwards of $200+. You’ll need to include the type/breed of animal you’re looking to have tanned when submitting your quote request so we can get an accurate quote for you. Full tanned pelts will be soft and very pliable to the touch. Tail Tanning: If you’re only wanting the tail tanned, whether it be to use as a key chain or just a keepsake, the price is $25+ depending on the size of animal. It’s important to note that the tail will be sometimes be split to allow the tail to be properly prepared and tanned. This usually is not super noticeable if the animal had a bushy tail. Paw Tanning: A very small memento, but can be very meaningful. I personally had my cat’s paw/forearm tanned and taxidermy mounted when he passed away. I’m so glad I had it done (I was on the edge at first if I wanted any of his fur kept). Prices start at $15 per paw and go up depending on the size of the animal. Valley Fur Shed’s usually only takes on 4 months of work at a time. From the time they start on your skin to the time it is completed is usually only 3-4 weeks. These are purely estimates, and may vary with their workload at the time. Tanning fur is the professional way of preserving fur. It is a chemical process and yields high quality washable leather. It is not a home “tan” of borax or anything similar. The small business that we send the skins to is called Valley Fur Shed. They are also a one-man business that often shuts down commissions because they like to take their time on the skins they have to ensure the end product is high quality. They do an amazing job tanning, and work on many many pets, which is why OddArticulations, LLC has paired up with them to offer fur tanning services to our clients. Valley Fur Shed has a page dedicated to showing and explaining their entire prepping and tanning processing which you can see here. Warning, there are raw skins shown, so view with caution. Slippage. The fur can actually start falling out of the pelt if the animal has started to decompose, has been frozen and thawed multiple times, or if the temperature gets too hot. There are other factors that can cause slippage, these are just a few. Some slippage can be stopped, but there will still be bald spots in the pelt where the hair had fallen out. Tears/Knicks during skinning. 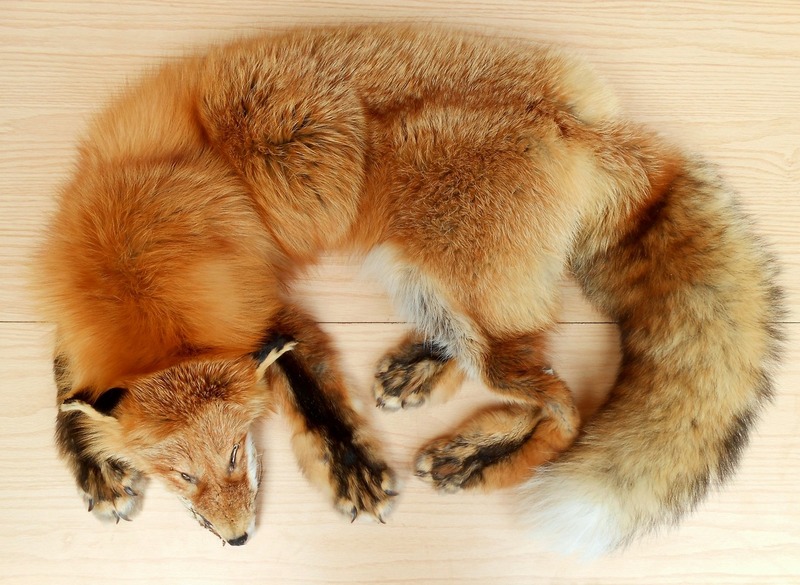 Both OddArticulations, LLC and Valley Fur Shed take our upmost care while skinning and fleshing the hides, but slight tears or knicks may happen. These often are very minor and are barely noticeable in the end product. Shipping Delays. OddArticulations, LLC will pack the raw or salted furs with our upmost care, and all frozen skins will be shipped following our very detailed shipping instructions that you can read here. Even with amazing packaging, delays in shipping do occasionally happen, and there is nothing we can do if the skin is lost or delayed and arrives unusable. You may read Valley Fur Shed’s full Terms of Service here. Keep the pelt indoors, in a room that doesn’t get excessively hot or humid. Over time, heat and humidity will degrade the leather and make it delicate. Keep the pelt out of direct sunlight. Exposure to direct sunlight over long periods of time will fade the fur. Avoid getting the leather wet. The tan used produces leather that is washable and won’t be damaged from being wet, however it will dry somewhat stiff if the leather isn’t properly “broken” (stretched) when it dries again. If the fur gets dirty and needs to be cleaned, don’t submerge the pelt. Instead take a damp cloth with small drop of dish soap, wipe the fur clean, wipe the soap residue away with another damp cloth, then dry the fur. Shake out and brush the fur occasionally to remove dust and prevent matting if the pelt is frequently handled. Valley Fur Shed requires a minimum of 50% deposit of the tanning cost to be paid upfront. The remaining 50% is required when the fur is ready to be returned to OddArticulations, LLC. The shipping costs to/from OddArticulations, LLC and Valley Fur Shed will be added to the final bill you owe OddArticulations, LLC and is due when all services you requested from OddArticulations, LLC are complete. As will all of our commissions, OddArticulations, LLC only requires a $100 deposit to begin working on animals. This means you will be required to pay the $100 deposit required by OddArticulations, LLC and the 50% Tanning Fee required by Valley Fur Shed before we will begin working on your animal. It is possible for OddArticulations, LLC to delay shipping to Valley Fur Shed if you need time to gather the 50% deposit they require. Once you have read and understand the process above, you may go to our Inquires page to see what other services we offer and to request a price quote be sent to you. Make sure to include what tanning services you’re looking to have done (full body, tail, paw, or other).